BIA Taiwan & Hong Kong | "The Voice of the European Services Sectors in International Trade"
The Republic of China (Taiwan) has one of the most advanced and flourishing economies in Asia: its average GDP per capita is similar to that of Italy and close to the EU-27 average. With a long term growth just over 8% per annum over the past decades, it is undoubtedly one of the world’s fastest growing economies. The EU maintains good trade relations with Taiwan, but its conflictual political relations to Mainland China hindered the EU to so far go bilaterally beyond WTO commitments. As a result, a lot of trade barriers remain between the two parties despite the benefits their removal would have for both sides. Since 2008, Taiwan was ruled by the Kuomintang party (KMT), which positively impacted the country’s relation to Mainland China. This led to an easing of political tensions and to the signing of a bilateral trade agreement in 2010, which does not only facilitate trade between the two parties but also turned Taiwan into a potential hub for EU businesses to operate in China. Even though the economic crisis had had a slowing down effect on Taiwan’s growth, its economy is recovering: In the aftermath of the Global Recession, Taiwan suffered less than the EU and US. Partially shielded by its peculiar position within the global political economy, its growth rate registered a promising +3.7% in 2013-2014. This shows how the economy is recovering steadily through capital investment and private expenditure (EIAS 2015, 33). The IMF has forecasted that it will perform better than other advanced Asian economies: It is expected to grow at 4.09% per year from 2015 to 2020, which is higher than Hong-Kong, Singapore and South Korea. The inclusion of Taiwan in the Commission’s new Trade Communication “Trade for all”, adopted in October 2015, is a major step in the right direction, stating that “the EU will explore launching negotiations on investment with Taiwan”. A Bilateral Investment Agreement (BIA) with Taiwan would go beyond investment protection, adopting a comprehensive approach with respect to market access as well as to rules that improve the overall regulatory framework. The report entitled “Taiwan and EU Trade and Economic Relations: The Case for a Deep and Comprehensive Bilateral Investment Agreement” drafted by ESF, and co-sponsored by the Bureau of Foreign Trade of Taiwan, was to be presented on 24th November in Brussels at the European Institute for Asian Studies – EIAS. The Report was presented during a seminar at the European Institute for Asian Studies in presence of Ms Mei-Hua WANG, Vice-Minister of Economic Affairs, Taiwan. 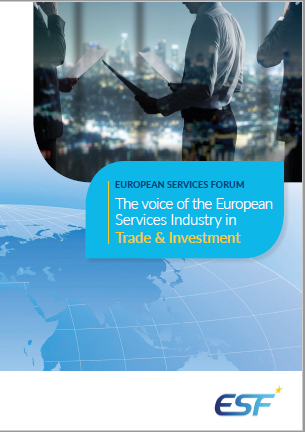 It aims at making an in-depth survey on the potential benefits of an EU-Taiwan trade and investment agreement for both sides; focusing on assessing the potential gains for the European services sector that could result from a liberalization of the Taiwanese market. The report furthermore identifies the specific issues that a potential bilateral investment agreement should address and asks whether Taiwan could potentially become a hub in East Asia for European companies. It then make suggestion on the content of a Deep and Comprehensive BIA. In a Joint Statement issued on 20 September 2016, the Global Services Coalition is urging TiSA negotiators to redouble their efforts to reach agreement on strong and effective rules for all services sectors guaranteeing free flow of data and prohibiting forced data localisation. As businesses around the world compete in the global market, the free flow of data across borders has become the life blood of trade. All trade in goods and services – from the placing of an order to confirmation of delivery – now involves the electronic transfer of data. Data-transfer is today’s all-purpose means of business communication, spurring economic growth and innovation in all industries. 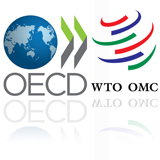 This means that forced data localization policies and practices, where they exist or are proposed, have emerged as a major trade barrier, threatening to disrupt the continued growth and success of trade and commerce worldwide. The European Union views Hong Kong as a major trading partner, this not only because the amounts of goods trading between the two countries but also because the EU see Hong Kong as a access point into China. After China, the EU is Hong Kong second biggest trading partner for both in goods and services. Hong Kong is in the top 20 trading partners in the EU. After the British Virgin Island and China, Hong Kong is a major source of foreign direct investment and has a the largest amount of foreign companies based in the country. Hong Kong also has climbed in the ranks to become the 7th largest foreign investor in the EU in terms of direst investment stock. Hong Kong acts as an important channel for trade and investment between the EU and China. In 2013. 9.5 billion euro of China’s imports of goods from the EU went via Hong Kong and about 27.4 billion euro worth of goods went the other way. Since 1978 when China adopted its open door policy trade relations grew rapidly. Hong Kong’s role as a channel to China means it offers high-value opportunities for EU companies. In fact, the EU is the leading source of foreign companies using the Hong Kong-Mainland China Closer Economic Partnership Arrangement (CEPA). Because of the high potential of CEPA, the EU and Hong Kong regularly communicate on CEPA developments and explore ways to maximise the opportunities for EU companies and investors.